Canberra Band 538 has quickly established a reputation for providing the very best high quality performances. “Professional, Reliable and Entertaining” are words that are frequently used to describe Canberra Band 538. They will perform in ties and coats and provide a DJ service between sets – Free of charge. Unique to Canberra Band 538 is the fact that they don’t bring in other musicians. The same 5 piece sound at every performance. They will, of course, customise the songs to suit the event and even include your requests for that unique and individual performance including your special wedding song. There are three things your guests will remember, how beautiful the Bride looks, the food and the music. 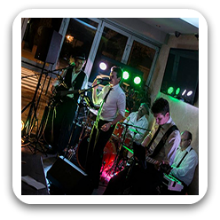 Canberra Band 538 welcomes requests and will play something for everyone from your best friends dance hits through to your creepy uncles Rock classics, your guests will remember everything about your special day and that “great band”. Canberra Band 538 is the only five-piece band able to learn you’re your first dance request, or play your special song as you enter the reception. Canberra Band 538 will work with you to ensure the music reflects you. Unfortunately, Canberra Band 538 does not perform at every wedding they are invited to play at. If your idea of a wedding celebration is a keg and ten mates in the backyard, they are not the band for you. Canberra Band 538 typically performs at weddings where the amount of guests is appropriate to the venue and the theme such as ”Elegant and sophisticated”. A corporate event reflects the organisers and Canberra Band 538 are well suited to events such as Ceremonies, Christmas parties, product launches, opening nights or fundraising; basically, any event that requires a lasting impression. 1. The only band able to play Jazz and Rock Covers. 2. They only perform in Ties and Jackets. 3. They are always the first to arrive and last to leave. 4. They provide a Free DJ service between sets. 5. They are not the cheapest because they are the best! Are You Going To Be My Girl? We held our Christmas party on the Southern Cross Club Cruise Boat. To make the night more enjoyable we hired a band for entertainment. I searched for bands within the Canberra region and found “538” on Black Tie Group’s website. I was able to get quote quickly and the price was great, especially being a 5 piece band! I spoke with them early on and from there the process was simple. The only thing I had to do was go through the song list which they very clearly listed in an email and they were happy to make any changes we may have, which I didn’t as the list was spot on. They asked for the age ranges of staff attending our party so that they could capture the right styles of music. I had advised the guys that it was a cocktail style function with a Masquerade mask theme, the boys turned up in black suits and masks! It was fantastic and well above what we expected. Early on in the evening before the formalities the band played while people listened and got to see the sites from the boat; after formalities were over that’s when the fun really began. The dance floor was full until the boat docked later in the evening. The music was amazing, the band was friendly, engaging and they got into the fun with us. 538 were extremely professional from the first phone call through to the end of the event. They arrived early to ensure the set up was perfect (which it was), any messages or phone calls were answered quickly and for an event that had ages ranging from 20 through to 60 they catered perfectly for everyone and made sure the party was one to remember. There was not a second that the dance floor wasn’t full of people dancing and that’s the best kind of review. 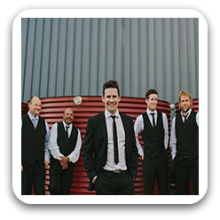 I highly recommend band 538 for any function and we certainly look forward to booking them again at our next corporate event. Thank you guys, everyone is still talking about the night and how much fun it was dancing away on the boat. We will certainly be in touch in the future! !